on the Mosel River. This hamlet survives entirely on tourism. Of course, it wasn’t always this way, as the castle ruin and vineyards surrounding the village tell a story of a bustling crossroads of trade where wine was used as a second currency. Nowadays, the currency is the Euro and the tourists bring it by the boatload to spend on wine, good food and trinkets. Our guests always love the vantage point of the Klosterstuble Cafe and our secret table with the unforgettable view. 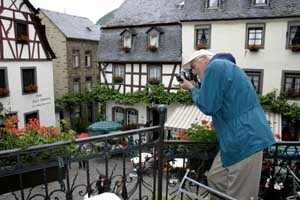 The shot above shows guest Rudy Rice capturing the essence of the tiny marketsquare on May 26.